Our cupping lab at Bennetts HQ is where the magic happens. Each and every sample that passes through the front door is rigorously tested, screened, roasted and cupped; whether it be an offer, pre shipment or arrival sample. We cup to determine quality and ensure consistent supply. We follow SCAA screening and cupping protocols to ensure our results can be calibrated with our origin partners and the wider industry. Heading up the quality department is our QA extraordinaire Georgia. She has been with Bennetts since 2011 after beginning her quality assurance career in the dairy industry. Under her command the cupping lab runs like a well-oiled machine and is the epitome of organisation. She is most renowned within the office for her unique data log of sensory acuities. She has an extraordinary ability to pinpoint the oddest of flavours and can often be heard using phrases such as ‘like the last dried apricot squashed at the bottom of the packet’ or ‘the lingering crumbs of a dark chocolate covered sesame snap’. We attribute this unique skill to her upbringing as she has grown up around food – her parents own and manage a vegetarian restaurant in Richmond and she has just published a cookbook. Georgia gained her Q Grader certification in April this year and proudly did so on her first attempt. No easy feat we assure you. When she is not lyrically delivering cup notes she can be found watching, reading or talking about films. For most of the month of August she lives at the Melbourne International Film Festival and we generally wait for her reviews prior to purchasing tickets to risk disappointment. Michael is the latest addition to the Bennetts team. He is our head roaster and divides his time between sample roasting and quality control. He is also a Q certified cupper and facilitates our daily cupping sessions with Georgia. He joined the team in March this year and has come from an extensive background in the industry; having spent time as a barista, roaster, delivery driver and quality control manager! With his widespread skill set he has brought a new level of expertise to the Bennetts QA lab and we are thrilled to have him on board. He has quickly established himself as the resident ‘muso’ of Bennetts. It is rare to find him in a silent room and he has already introduced a new daily musical routine to the office; the cupping session soundtrack. If you are a follower of Bennetts on Twitter (link) you may have noticed our recent soundtrack session tweets. His musical talents are widespread; he plays drums in local band ‘Howl at the Moon’ and in his spare time learns classical guitar. He also pours a mean rosetta and has been hosting ‘latte art 101’ classes around the espresso machine of an afternoon. I am classified as a pseudo member of the quality department. Taking care of marketing and social media, I flit in and out of the cupping lab to taste, take photos and keep up with the latest arrivals. I can often be found acting the part of the stereotypical ‘instagrammer’ – perched on a step ladder trying to get the best aerial shot of a full cupping bench. I spend my time taking care of the Bennetts’ Twitter, Facebook and Instagram accounts; in addition to writing content for the website and organising marketing initiatives. My phone is never more than a few steps away and I’m always ready to snap an action shot. Although I am very comfortable behind the camera, I am known for being a serial photo-avoider and try my best to stay out of focus. I will, however, very happily guide you through an endless album starring my miniature dachshund Harvey – who is rather cute if I do say so myself. Bennett, also known as Benny, rounds out our quality department. He takes care of sample roasting and screening on a casual basis. Having worked with Bennetts for five years he is almost part of the furniture in the cupping lab. Over the time he has developed widespread experience in roasting and quality control. His lumberjack beard has earned him the title of resident ‘hipster’ in the Bennetts office and his styling techniques are a topic of regular conversation. Benny is the official Footy Tipping Coordinator and runs a tight ship when it comes to rounding up the troops in March. Unfortunately his organisational skills have not translated on the field this season, finishing just short of a medal in fourth place. He is also a keen fisherman; so much so that his skills with a rod have attracted a waiting list amongst the Bennetts staff for a share in the daily catch. Our QA team are dedicated to ensuring you have access to all product information at your fingertips and consistently receive superior quality beans. 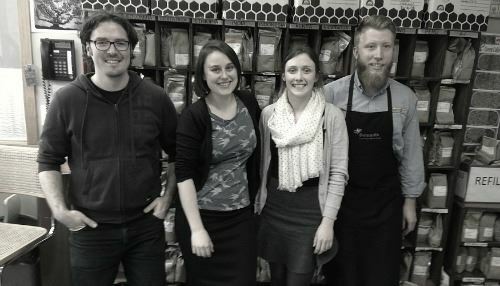 They are a wealth of knowledge and are more than happy to answer questions, offer advice and run dedicated cupping sessions – all you need to do is ask. To speak with Georgia, Michael, Bennett or myself contact the office or send a message via Twitter or Facebook.